Real property conveyances are governed by Title 89 of the Mississippi Revised Code. The state does not provide a statutory form for warranty deeds, but it sets forth acceptable language for deeds under Miss. Code Ann. 89-1-61. Warranty deeds are used to convey property from the grantor (generally the owner) to the grantee (generally the purchaser) with the fullest surety of title (Miss. Code Ann. 89-1-33). By using the word "warrant," the grantor guarantees that the he or she holds clear title to the real estate, has the right to sell the property to the grantee, and he or she will warrant the title against all persons whomsoever. This guarantee extends throughout the property's history. The grantor also warrants that they did not encumber the property in a way prohibiting transfer, and that the deed references all easements, restrictions, or other agreements of record that relate to the specific parcel of land. As with any conveyance of real estate, a warranty deed requires a complete legal description of the parcel and an explanation of the source of title. In addition to meeting all state and local standards for recorded documents, a lawful deed must include the grantor's full name and marital status, as well as the grantee's name, marital status, address, and vesting. Vesting describes how the grantee holds title to the property. For Mississippi residential property, the primary methods for holding title are tenancy in common, joint tenancy, and tenancy by the entirety. A grant of ownership of real estate to two or more persons is presumed to create a tenancy in common, unless otherwise stated in the conveyance (Miss. Code Ann. 89-1-7). All deeds must be acknowledged before any of the officers listed in Miss. Code Ann. 89-3-3. The deed must be in writing, signed by the grantor and delivered to the grantee (Miss. Code Ann. 89-1-3, 89-5-27). A conveyance of real estate is not considered good against a purchaser for a valuable consideration without notice unless the deed is recorded by the Clerk of the Chancery Court of the county where the property is situated. (Miss. Code Ann. 89-5-1). Include all relevant documents, affidavits, forms, and fees along with the deed for recording. This article is provided for informational purposes only and is not a substitute for legal advice. 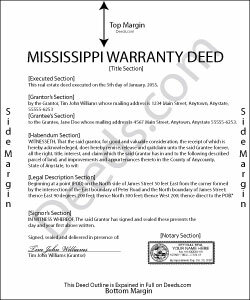 Contact a lawyer with questions about warranty deeds or transfers of real property in Mississippi.